Mobile devices are easily lost or stolen due to their small size and portability. A mobile device that is accessible to unauthorized users poses a risk to the confidentiality, integrity, and availability of health information on the mobile device. If you physically secure your mobile device, you can limit the risk of unauthorized users tampering with or stealing it. How can you maintain physical control of your mobile device? Physically secure your mobile device. Locking the mobile device in a secure location, such as a locked drawer, prevents unauthorized users from accessing data through or on the device. Lock your mobile device screen when not using it. Locking your screen can prevent unauthorized users from accessing data through or on the device. A screen lock requires a password to unlock the screen. Read more about passwords or other user authentication. Keep your mobile device with you. If you cannot keep it with you, physically secure your mobile device. Do not let others use your mobile device. 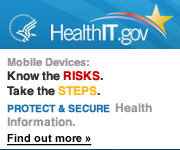 If you share your mobile device with others, you increase the risk of an unauthorized user looking at health information they are not authorized to see.